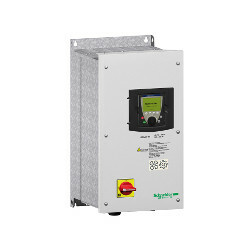 Variable speed drive ATV61 - 0.75kW 1HP - 380...480V - EMC filter - IP54. Assembly style: Enclosed with Vario switch disconnector. Variable speed drive ATV61 - 11kW 15HP - 380...480V - EMC filter - IP54. Assembly style: Enclosed with Vario switch disconnector. Variable speed drive ATV61 - 15kW 20HP - 380...480V - EMC filter - IP54. Assembly style: Enclosed with Vario switch disconnector. Variable speed drive ATV61 - 18.5kW 25HP - 380...480V - EMC filter - IP54. Assembly style: Enclosed with Vario switch disconnector. Variable speed drive ATV61 - 22kW 30HP - 380...480V - EMC filter - IP54. Assembly style: Enclosed with Vario switch disconnector. Variable speed drive ATV61 - 30kW 40HP - 380...480V - EMC filter - IP54. Assembly style: Enclosed with Vario switch disconnector. Variable speed drive ATV61 - 37kW 50HP - 380...480V - EMC filter - IP54. Assembly style: Enclosed with Vario switch disconnector. Variable speed drive ATV61 - 45kW 60HP - 380...480V - EMC filter - IP54. Assembly style: Enclosed with Vario switch disconnector. Variable speed drive ATV61 - 55kW 75HP - 380...480V - EMC filter - IP54. Assembly style: Enclosed with Vario switch disconnector. Variable speed drive ATV61 - 75kW 100HP - 380...480V - EMC filter - IP54. Assembly style: Enclosed with Vario switch disconnector.